1/12, Sunday - Annual Meeting/Annual Hike Planning Meeting We will meet at 2:00 p.m. in the Family Resource Agency’s conference room, as in ages past. The Family Resource Agency is located at 3680 Michigan Avenue in Cleveland, just south of Antonio's Restaurant at the corner of Michigan Avenue and Stuart Road. To get there from I-75, turn onto Exit 27 and head east on Paul Huff Parkway. Continue east; when you cross US 11/Lee Highway, Paul Huff turns into Stuart Road. Continue on Stuart Road past Jordan’s’ BBQ on the right, the large First Baptist Church on the left, and past the YMCA on the left. Go over the railroad overpass. The next intersection is Michigan Avenue. Turn right there (at Antonio’s Restaurant), and the Family Resource Agency is just a short ways down on the left. All those CHC members who are willing to lead a hike in 2014 are very encouraged to attend, as well as any members wanting to provide input to our hike planning process in a positive way. James Anderson will ho st the meeting. 1/25, Saturday – Hike at Point Park at Lookout Mountain. 5-6 miles easy-moderate. Leader: Rick Foster. Rating: easy to moderate. Length: 5-6 miles. This hike will start at Cravens Terrace and proceed around the north end of Lookout Mountain to Point Park and Sunset Rock. The plan is to take the Upper Truck Trail to Rifle Pits Trail and switch back across the end of the mountain to Point Park, then take the Bluff Trail to Sunset Rock. The return trip takes Gum Spring Trail back to the Upper Truck Trail and Cravens Terrace. Meet at Upper Truck parking lot at 12:00 noon. Directions to the trailhead from the east: take US 11 (Chattanooga’s Broad Street) south under the railroad bridge to Lee Highway (a sharp right) up the end of Lookout Mountain. Near the highest point, turn left onto Lookout Mt. Scenic Hwy (State Road 148). The second right after that, Cravens Terrace (marked “Guild Trail” on the linked map; see below) looks like part of a parking lot for Ruby Falls. Follow it west to the park at its end. Directions to the trailhead from the west: take US 11 (Lee Highway) east from the light at the Browns Ferry Road intersection. Make the next right (old Wauhatachie Pike, State Road 318) and follow it up the end of Lookout Mountain. Take the second right onto Lookout Mt. Scenic Hwy (State Road 148). The next right after that, Cravens Terrace (marked “Guild Trail” on the linked map; see below) looks like part of a parking lot for Ruby Falls. Follow it west to the park at its end. Directions to the trailhead from the south: GA State Road 189 becomes TN State Road 148 and drops to the east, becoming Lookout Mt. Scenic Highway. Follow it to Ruby Falls and fork left onto Cravens Terrace (marked “Guild Trail” on the linked map; see below) which looks like part of a parking lot for Ruby Falls. Follow it west to the park at its end. Contact Rick Foster at habitathound@gmail.com for more information. Trip Report: Seven people (including three club members) and one dog hiked the north end of Lookout Mountain in Chattanooga for four hours. The route used the Upper Truck Trail to the Rifle Pits Trail to Cravens House; then it used the Mountain Beautiful Trail. We then took an alternate trail to Point Park for lunch. The view was good, the weather steadily improving, and ice formations were interesting. After lunch we took the Bluff Trail to Sunset Rock, and then traversed the Gum Springs Trail back to the Upper Truck 4 Trail. Pictured below are the brave hikers. Club members who attended included Rose Hambright, Randy Morris and Rick Foster (hike leader). Meetup guests included Shirley, Deborah, Olga Cinnamon, and John with his trusty canine companion. Not pictured is Deborah, whom we thank for taking this picture. 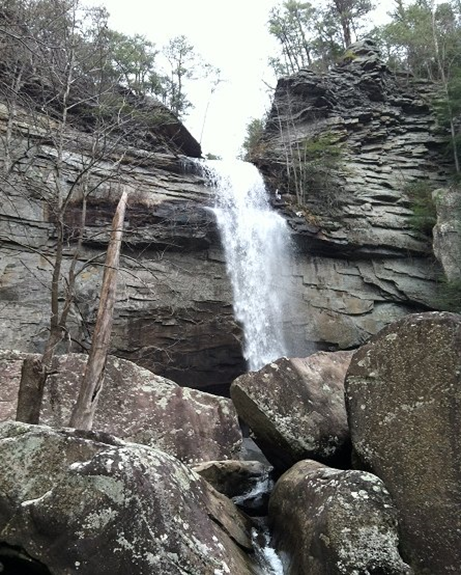 2/1, Saturday – Hike at Thunder Rock off Highway 64, on the Benton-MacKaye Trail. Hike leader: Clayton Pannell. 3 miles with a car shuttle, easy. Also an optional climb, strenuous. Meet at the Thunder Rock parking lot at 9:00 a.m. We will do a car shuttle up FSRD 45 to where the BMT crosses the road. We will hike south on the BMT to the Thunder Rock Express, and follow it back to the power house and the parking lot at the trail head (About 3.5 miles). Anyone who wishes to do the BMT from the Thunder Rock campground to FSRC 45 may do so at the start or the end of the hike. Note that this trail is a bike trail as well, and may have bicyclists on the trail. this is a winter hike so please dress in layers for cold weather. Bring plenty of water too, since the winter dry air can dehydrate you as much as summer air! Post-Trip Report: One dozen beautiful ladies along with two old men (sic) came out to hike on the Thunder Rock Express Trail. The weather started out in the high 20’s Fahrenheit, but it warmed up to make hiking a great joy. After the snow storm and cold weather of the preceding week, there was only a very little snow and crunchy ice on some of the shady sections of the trail. On the trail we checked out the rock in the tree; it is still there! We did not encounter any bike riders on the trail; we only saw them in the parking area after we got off the trail. Al and I, two Groundhogs on the same trail, thank the ladies who sang Happy Birthday to us both. I offer a great big “Thank You” as well to the ones who helped with the car shuttle. Hikers included club members Aggie Scott, Becky Levings, Debbie Koenig, Sheila Bailey, Ruth Gafford, Rose Hambright, Al Rymer, and hike leader Clayton Pannell. Meetup and personal guests included JoAnn Ratcliff, Holly Ratcliff, Carina Davis, Olga Cinnamon, Shirley Wright and Deborah Webb. 2/13, Thursday – Club meeting at the Monterrey Restaurant in Cleveland. Ann Grey made the reservation with “Ebaoisto” for 6:00 p.m.
2/22-23, Saturday-Sunday – Big Frog overnight backpack at Chestnut Ridge. 3 ½ - 4 miles one way, difficult. Leader: James Anderson Meet at 10:00 a.m., head up mountain at 11:00. This hike will go up via the Chestnut Mountain-Wolf Ridge trail route; this being the shortest route up the Big Frog Mountain. It is about 4 miles in length each way and involves a little more than 2,000 feet of elevation change. Due to this it would be considered strenuous. Since this is a backpack, if you are interested in going you will need to contact James by phone (cell 423-715-8824) no later than 7:00 p.m. on Friday the 21st. He will give you directions to the trailhead and the meetup time. Also, if you have any questions as to what to bring in your pack, please do not hesitate to contact James. If it is really cold or there is a substantial chance of precipitation, the hike will be postponed. If the weather cooperates, Big Frog does offer some awesome views off to the west, especially in the winter time. If anyone wants to just day-hike the trail with us, and then go back down on your own, that is also an option. 3/1, Saturday – Hike at Laurel Falls/Buzzard Point. Strenuous with climbing in places, 8 miles. Leader: Randy Morris. We will hike approximately 8 miles in the Laurel-Snow Section of the Cumberland Trail near Dayton, TN. The plan is to hike to Laurel Falls and combine it with the fantastic vista of Buzzard Point in a hike throughout the Richland Creek Gorge. The trail contains nice cascades along Richland Creek, the entrance to Richland Mine, impressive rock formations and the great overlook at Buzzard Point which looks back over the Tennessee Valley. The hike does involve moderately tough climbs to the top of the gorge going to both the falls and Buzzard Point and rocky terrain. Combined with the length of the hike I rate the hike as strenuous. For more information you can go to www.cumberlandtrail.org/laurel-snow.html Please call Randy Morris at 423-650-0485 no later than 8 p.m. Friday, February 28 if interested in attending for more details. HIKE REPORT: Ten hikers enjoyed an approximately 8 mile hike on a cool, overcast day in Richland Creek Gorge. We first hiked along Richland Creek and climbed up to Laurel Falls, which was spectacular with late winter water volumes. We also enjoyed the assortment of impressive and interesting rock formations along the path. After coming back down to the creek bed, we crossed over the creek and progressed upward to Buzzard Point, which was very refreshing to say the least, as the winds were howling. After a quick lunch we retreated from the mountaintop and left it to the buzzards, as yes, there were buzzards circling at Buzzard Point. Three club members and seven guests from all over East TN attended—Crossville, Maryville, Kingston and of course, Cleveland! See the 2 pictures below for a glimpse. 3/7-9 - Appalachian Trail Kickoff" Amicalola Falls State Park, Dawsonville GA - Are you an aspiring 2014 Appalachian Trail "thru-hiker" - or have you just DREAMED of hiking this world famous scenic trail ? Come to the "ATKO" (Appalachian Trail Kick-off) and try to increase your odds of getting from HERE all the way to Mt. Katahdin , Maine ! (2,185.9 miles / 14 states north of nearby Springer Mountain ... the southern terminus of the Appalachian Trail). This annual event has been held at Amicalola Falls State Park for the last 13 years - where "AT" experts, authors, vendors, the Appalachian Trail Conservancy, hiking clubs / organizations and "newbie" and veteran hikers alike - ALL congregate in one place - at one time - to meet, greet, educate and give the north-bound "thru-hiking" class of 2014 the send off of a lifetime! The BMTA will be there with our Display and, on Saturday morning, March 8th at 9a.m., Board Member Bob Ruby will give a slide presentation and talk. Come see us!! 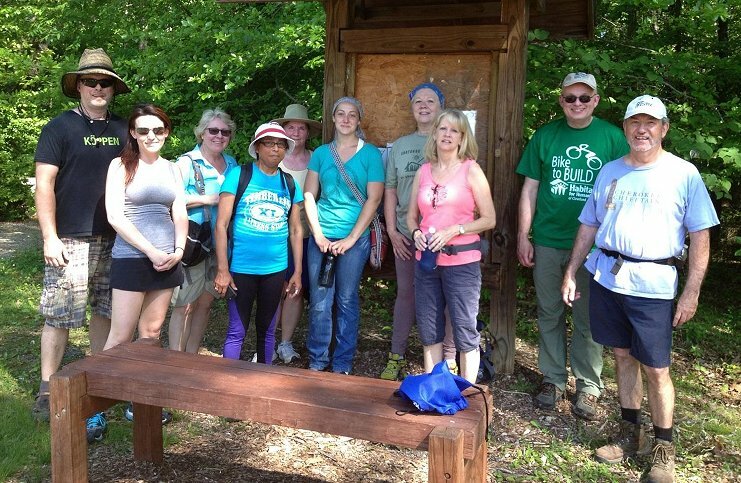 3/16 - Athens Regional Park Hike - Hike leader: Jane Bohannon. Rating: easy to moderate. Length: 3.1 miles around loop. The Athens Regional Park Trail has its ups and downs and scenic views in woodland, an open field, and the paved area around the lake. It is a hike around the perimeter of the 165 acre park and along North Mouse Creek where beavers are sometimes seen. I am leading this hike for both the Cherokee and Hiwassee Hiking Clubs. We will start at the area around the lake, hike along North Mouse Creek, then through the wooded areas, and back to the trailhead. This is a nice gentle hike to get us out after the holidays and snow. Directions to the trailhead from Cleveland: The park is located on State Highway 30 West (Decatur Pike). Take I-75 north to the first Athens Exit, then turn right onto Highway 30 toward Athens. The park is approximately 1 mile on the right. Directions to the trailhead from Etowah: take State Highway 30 through Athens all the way to the park. The park is approximately 1 mile on the left from the State Highway 11 (Congress Parkway) and Highway 30 (Decatur Pike) intersection. Please plan to meet at the trailhead at 2:30 p.m. on Sunday afternoon for signing in. The mountain bike/hiking parking lot is the first turn to the left after entering the park. Children accompanied by an adult and dogs on a leash are welcome. If interested in attending, please contact Jane Bohannon by Saturday evening March 15 at 745-9534 or 381-8388 (cell). 3/13, Thursday – The Club will meet at the Golden Corral Restaurant in Cleveland on Thursday March 13 at 6:00. This restaurant is one of our old standby’s which always serves up a hearty meal in buffet style. The Golden Corral is located centrally at 350 Stuart Road. If traveling from Chattanooga or points north, take I-75 to Exit 27 and turn east on Paul Huff Parkway. Continue on Paul Huff, passing over the intersection with Keith Street (Highway 11/Lee Highway). After that intersection, Paul Huff becomes Stuart Road. Go a very short way, and you will see Golden Corral on the right, right across Stuart Road from the Hobby Lobby. 4/5 Saturday – John Muir Cleanup. Hike leaders: Clayton Pannell and Debbie Flower. Rating: easy. Length: 3 miles with car shuttle, 6 miles both ways. This event is the semi-annual cleanup of the Cherokee Hiking Club’s designated trail: the section of the John Muir Trail starting at the Childers Creek Parking Lot in Reliance, and continuing to the next parking lot. Meet at the Childers Creek Parking Lot in Reliance at 9:00 a.m. If attending, please call Clayton Pannell at 423-435-1848 cell, 423-263-9730 home or Debbie Flower at 423-310-2480 cell, 423-476-3907 home. Directions to the trailhead from Cleveland: head east on U.S. 64 until you reach the intersection with U.S. 411, and take the exit to 411. Turn left on 411, heading north. Continue through Benton. A few miles later you will see the Hiawassee Corner Market on the right; that is the intersection with TN State Highway 30. Turn right down 30, heading east. Continue a few miles until you reach the intersection with TN State Highway 315, and turn left there. After crossing the bridge over the Hiwassee River, take an immediate right on Childers Creek Road. Continue a short ways until you see the Childers Creek Parking area on the right, and turn there. REPORT: Five members and one guest came out on a very cool and sunny day to perform our spring cleanup on the club’s section of the John Muir Trail and to pick up trash. We came upon a very small amount of trash; the person with the lopper had the most work to do. We also cut some small trees out of the trail; one was 7 inches in diameter which we had to cut with an ax. Several spring flowers were in bloom, including blood root, violets, trillium and phlox. Our trail is now in overall good shape, with a low-hanging tree at the bridge over Childers Creek and a blow-down with three trees near Big Bend. Our workers included club members Kathy Seymour, Carol and Carroll Guhne, Rose Hambright, hike leader Clayton Pannell and guest Bill Aly. I thank all the people who came out to work and those who helped with the car shuttle. 4/10 Thursday – Hiwassee/Cherokee Hiking Clubs annual joint meeting. Bring a potluck dish to the United Methodist Church in Etowah at 6:00 p.m.
April is the month for our annual joint meeting with the Hiwassee Hiking Club. We will meet at the Wesley Memorial United Methodist Church in Etowah on Thursday April 10 at 6:00 p.m. Please bring a dish of some kind to share at the meeting. Directions to the church from Cleveland: head east on U.S. Highway 64 until you reach the intersection with U.S. Highway 411, and take the exit to 411. Turn left on 411. Go north on 411, going through Benton and over the Hiwassee River. Continue until you are in the south end of Etowah and turn left on 10th Street. The church will be on the right on the corner of 10th Street and Ohio Avenue, at 923 Ohio Avenue. 4/12 Saturday – First leg of the Appalachian Trail/BMTA hike. Hike leader: Randy Morris. Rating: strenuous. Length: 10.4 miles. This hike covers parts of the Benton-MacKaye Trail and Section 1 of the Appalachian Trail. We will drive to the Three Forks area below Blue Ridge off GA State Highway 60, and do a loop hike covering the first sections of both the AT and BMT long distance trails. These sections have lots to offer—good views, old growth trees and the history and thrill of being on the first section of each famous trail. This hike is rated strenuous due to the length and changes in elevation—around 1,200 feet up and down. I am planning on an average pace of about 2 mph. It will be a long day, but it should be a good one! We will eat in Blue Ridge after the hike. We will meet in the parking lot behind the Ocoee Hardee’s at 8:00 a.m. to carpool to the trailhead. Please call Randy Morris at 423-650-0485 no later than 8:00 p.m. Friday, April 11 if interested in attending. Directions to the carpool location from Cleveland: head east on U.S. 64 until you reach the intersection with U.S. 411, and take the exit to 411. Turn left on 411. The Hardee’s will be a very short ways down on the left. Hike Report: Four hikers drove down to the Three Forks trailhead below Blue Ridge, GA to begin this loop hike covering the first sections of the Appalachian and Benton-MacKaye Trails. We set out on the AT to Springer Mountain and encountered many hikers going in reverse on a beautiful, warm day. These included some through-hikers just beginning their long odysseys to Maine. After a climb of approximately 1,500 feet in about 4.1 miles to the top of Springer (elevation 3,782 feet), our group decided to split —with two hikers returning on the AT to take advantage of a shorter return trip with practically no uphill portions. The other two returned on the BMT—traveling an extra 2+ miles with significant climbing during most of the first four miles as the trail goes off the side of the mountain and meanders back and forth a couple of times across the AT. The hikers covering the entire loop had in excess of 2,000 feet of elevation gain and loss. We all enjoyed great views off of Springer Mountain, impressive hemlock and white pine trees, and great creeks with cascades. Six hikers, including Clayton Pannell as hike leader, met at the Hardee's in Ocoee to car shuttle to Amicalola Falls in the Amicalola State Park in Georgia. Clayton’s son George Pannell registered as a through-hiker on the Appalachian Trail (AT), after weighing his pack and taking a lot of pictures. Then we started the long drive up to the parking lot near Springer Mountain.The parking lot was full of vehicles and a lot of hikers getting ready; many looked to be through-hikers. The Cherokee Hikers (mostly day-hikers) hiked to the top of Springer Mountain on the AT and had lunch on top of Springer with another crew of hikers. We also met Randy Morris and his group of hikers doing the longer Springer Mountain hike for the CHC. We returned on the Benton MacKaye Trail to where it crosses the road and were picked up in a shuttle by Otis George’s dad. 4/11-13, Friday-Sunday – Trails and Trilliums, a festival of wildflowers and unique hikes in the South Cumberland State Park near Sewannee TN. This event also features a performance by Joe Wiegand, the famed Teddy Roosevelt reprisor. See http://www.trailsandtrilliums.org/ for more info. This is the 11th year of this event, a festival of wildflowers and unique hikes held in the South Cumberland State Park near Sewannee TN. This event features a performance by Joe Wiegand, the famed Teddy Roosevelt reprisor, 15 guided hikes, a native plant sale, workshops on garden design and native plants, Art for the Park and children’s events. See http://www.trailsandtrilliums.org/ for more information and to register. 4/15-19, Tuesday-Saturday – The Spring Wildflower Pilgrimage, held in the Great Smoky Mountains National Park in and around Gatlinburg, is a unique event. This 5-day event features hikes, natural history walks, motorcades, photographic tours, art classes and indoor seminars that all highlight the wonderful natural treasures that are just emerging from their winter slumber in glorious displays, as well as the traditional arts and culture of the Appalachian region. Additional highlights include the wonderful antique and art and crafts shops in the area, and the famed Arrowmont School of Arts and Crafts in Gatlinburg (http://www.arrowmont.org/). 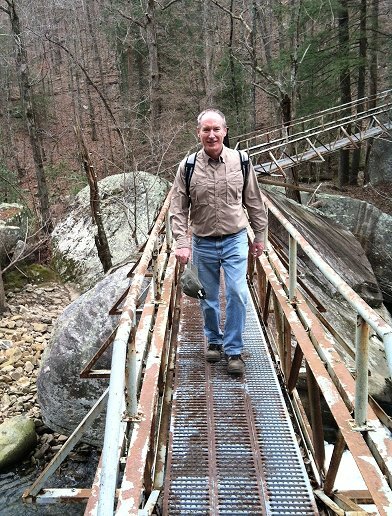 Cherokee Hiking Club Vice President Leon Bates will be one of the many that will be leading the nature hikes. Online registration is currently going on. The cost is $50 for one day and $75 for more than one day per person age 13 and up, $15 for one or more days for high school and college students (student ID will be checked), and children under 12 are free. The cost does not include lodging or meals. See http://www.springwildflowerpilgrimage.org/ for more info and to register online. 4/27, Sunday – Scenic Spur Trail hike, 3 ½ miles round trip. Moderate; steep in some places. Meet at the Greasy Creek parking lot. Leader? 5/4, Sunday – Harrison Bay Loop Trail – 4 ½ miles, easy. Leader: James Anderson. This hike is being mentioned in the April newsletter because it takes place so early in May. It will also be posted in the May newsletter. We will meet for a car shuttle at 1:45 p.m. in the parking lot of the Cleveland Home Depot at 546 Paul Huff Parkway. The alternative is to meet at 2:30 p.m. in the parking lot of the Harrison Bay State Park marina on 8411 Harrison Bay Road, off TN State Highway 58. The trailhead is on the south side of the parking lot. The trail is an easy 4.5 miles of pretty level terrain and offers some nice views of the lake. If the weather is bad the hike will be cancelled. For more information, contact James Anderson at 423-715-8824 (cell). Trip Report: One toad, three deer, and a thousand ticks! On a bright and sunny spring Sunday afternoon 11 hikers completed the 4.5 mile loop trail at Harrison Bay State Park. The hikers included some from the Club, some Meetup guests and some personal guests. The going was pretty easy and relatively flat. The company was good, and some of us made new friends. The view of the Bay from the marina and the trail was enjoyable. As mentioned above, we observed deer and toads, and the ticks were out and enjoying themselves at our expense. As reported by hikers also on the trail but not in our group, the snakes were out and about as well. But all in all, a good time was had by all. The picture below shows our group: members James Anderson (hike leader), Randy Morris, Laura Hertz, Rebecca Levings, Debbie Koenig, and guests TaLeah Schneiter, Puspa, Olga Cinnamon, and James and Phyllis Anderson’s daughter and son-in-law. Taking the picture: Phyllis Anderson. 5/10, Saturday – Coker Creek Falls Trail – Combined Coker Creek hike and May monthly meeting at the Mountain Hideaway Restaurant in Coker Creek. Hike leader: Marc Bernatti. Kids and pets are welcome on the hike, but no pets are allowed in the restaurant for our meeting. The trail starts at the Coker Creek Falls parking lot, follows the creek and ends at the Benton MacKaye/John Muir trail junction near the Hiawassee River. At times when hill hugging, the footing is difficult. A walking stick could be useful. Bring enough water and a snack. The Welcome Center/Gift Shop in Coker Creek will be open to get some stuff you forgot and for a potty break. We’ll work out a shuttle arrangement and drop off a vehicle or vehicles at the bottom and bring those drivers back up to the trailhead parking lot. The dirt/gravel road down near the bottom can be rough, so we will need higher clearance vehicles with good traction to get down and come back out. Unless there will have been rain the previous week, that road should be good. The hikers will meet at the Coker Creek Welcome Center/Gift Shop/Post Office on TN State Highway 68 (Monroe County mile marker 34) at 12:00 p.m. (noon). Directions to the car shuttle location from Cleveland: head east on U.S. Highway 64, going through the intersection with U.S. Highway 411. Continue until you reach Ducktown, and turn left on TN State Highway 68, going north. Continue north on 68 for approximately 25 miles. Directions to the car shuttle location from Tellico Plains: travel south on TN State Highway 68 for approximately 10 miles. NOTE: there is no cell service up here in Coker Creek, so if you need to call the Coker Creek Welcome Center/Gift Shop/Post Office (phone 423-261-2286), please do so before leaving Ducktown or Tellico Plains. After the hike, our May Meeting will be held at the Mountain Creek Hideaway & Grille in Coker Creek at 4:00 p.m. (tentative time). Everyone is responsible for their own meal and drink costs (beer is available). For those who know the area, this restaurant was formerly called Tall Pines. You can check out their Facebook page at https://www.facebook.com/mountaincreekhideawayandgrille?ws&nr. Maybe we’ll be able to enjoy our dinner on that new deck. The restaurant/inn’s address is 108 Tall Pine Circle. Directions for those coming only for the meeting from Cleveland: head east on U.S. 64, going through the intersection with U.S. Highway 411. Continue until you reach Ducktown, and turn left on TN State Highway 68, going north for several miles. As you approach Coker Creek, you will see the Mountain Creek Hideaway & Grille off to your left. You will need to turn before you reach Coker Creek Village on the right. Directions for those coming only for the meeting from Tellico Plains: head south on TN State Highway 68. You will pass the Welcome Center/Gift Shop/Post Office off to the right (going about a mile past it), the “S” curves and Coker Creek Village on the left. The Mountain Creek Hideaway and Grille is located off to the right. For more information, please contact Marc Bernatti at 423-261-2573 or Merlgwen@tds.net. Please do not wait to contact me in Coker Creek as there is no cell service here! Many showed interest in coming, but with the early rain, not many showed up. Clayton Pannell, Randy Morris and Marc Bernatti (hike leader) were the only members that appeared, plus two guests: sisters from upstate New York who had been in the Coker Creek area all week working on the American Hiking Society trail project.Because of all the rain, the road down to the bottom of Coker Creek Falls Trail was too treacherous, so we just went to the Falls and then changed our schedule, hiking the Unicoi Turnpike Trail instead. The afternoon turned out clear and comfortable with a slight overcast. Along the Unicoi Turnpike Trail we saw numerous trilliums still in bloom, many lady slippers, various-colored wild azaleas and a few blooming mountain laurels. All in all it was a great day for hiking. We finished just in time to attend the May Meeting at the Mountain Creek Hideaway and Grille, along with a few other club members who arrived just for the meeting. The food was excellent.Below left is pictured our club president Clayton Pannell, who presided at the meeting, held on the new deck of the MCH Grille. Clayton is thrilled to be a newlywed; the lucky lady is fellow club member Ruth Gafford. Below right are pictured long time club member Brenda Harris and club secretary Richard Foster. All are welcome to join us for a day of “Paying it Forward” to the Tellico Ranger District of the Cherokee National Forest. This is not a Cherokee Hiking Club event, but all CHC members are invited to participate. Meet at the picnic area next to the beach at the Indian Boundary Campground in Tellico Plains at 8 a.m. Breakfast will be provided by Tellico Grains. Wear long pants, bring a lunch and plenty of water in a day pack. We will break up into crews of 8-10 people to work on a segment of trail somewhere in the local area. Then we will all return to the picnic area for a dinner provided by the Tellico Outpost (pizza) and burgers, etc. Also upon returning at the end of the day, all participants will receive a free T-shirt commemorating the day. Kids are welcome as well but must be attended by a responsible parent or guardian. This event also celebrates the naming of Tellico Plains as a Trail Town by the Southeastern Foot Trails Coalition and the Benton MacKaye Trail Association. Directions to Indian Boundary Campground from Cleveland: go east on U.S. 64 and turn north (right onto the exit, then left) on U.S. 411 in Ocoee. Continue through Benton and into Etowah. In Etowah, take a right onto TN State Road 310, heading east (Mecca Pike). This later turns into TN State Road 39. Continue until 39 dead-ends into TN State Road 68 on the outskirts of Tellico Plains. Turn right on 68, and then very soon turn left on TN State Road 165 (the Cherohala Skyway) and go through Tellico Plains. Continue on 165 for a little over 15 miles until the road curves very sharply to the right. Around there, Indian Boundary Road goes off to the left. Take Indian Boundary Road to the Campground. 6/12, Thursday – club meeting/potluck meal at Charleston Park in Charleston TN at 6:00. Ann Gray will arrange with Charleston Park. 6/13, Friday thru June 20, Friday – Grayson Highlands State Park (in VA) car camping trip. Bike riding and long distance hiking on the AT available, peak bloom time for the flame azaleas and rhododendrons. Leader: Clayton. Brochure of S.P. available, see Clayton. We will set up camp on Monday June 16 after 4:00 p.m. and check out on Sunday June 22. We have made reservations for 20 people, and have 18 members and guests signed up to camp throughout the week. Each person will be responsible for their food, tent and any other gear they need. Note: it is about 26 miles to a grocery store from the campgrounds. There will be bike riding and long distance hiking on the Appalachian Trail (AT) available, along with peak bloom time for the flame azaleas and rhododendrons. For a brochure of the Grayson Highland State Park, see Clayton or http://www.dcr.virginia.gov/state-parks/grayson-highlands.shtml . There are a lot of short hikes in the area and the AT is nearby, along with the Virginia Creeper bike trail. This is a group camping site and we will divide the cost out by the total number of campers, keeping the cost low. There will be no pets allowed on this camping trip.Our group reservation # is 2-25191426, in Clayton Pannell’s name. Trip report: We arrived on Monday afternoon at the group camping site in Grayson Highland State Park in southern Virginia. Clayton Pannell was our fearless event leader. It was our first time there and many campers had already selected their tent sites in the large group camping area. The group camping area was downhill from the parking area next to the road. The restroom was up along the road and did not have a shower, so to get a shower, one had to walk or drive to another restroom in another part of the campground. With such a large group of campers and so many trails to hike, smaller groups formed and hiked different trails at different times. The following is a day-by-day account of our many adventures. On Tuesday the 17th, after a slow start in the morning, club members Aggie Scott and Ruth and Clayton Pannell went to the Visitor’s Center to see all the exhibits and history of the area. Many of the items on display we remembered from our childhood. After the visit there, we hiked the Twin Pinnacle Trail, and saw a tree growing over a rock with its roots reaching down, covering three feet over the rock until they reached into the ground. The next thing we saw on that hike was the small Pinnacle, with 360 degree views of the surrounding mountains. Another group consisted of guests Judy and Johnny Pannell, who hiked to Mount Rodgers, a nine-mile round trip. A third group, made up of club members Debbie and David Flower, Carroll and Carol Guhne and their guests, hiked the Rhododendron Trail, seeing lots of wild ponies and great views of the area. On Wednesday the 18th, Debbie and David Flower and Carroll and Carol Guhne went for a bike ride on the Virginia Creeper Trail, riding down from White Top Junction to Damascus. Meanwhile, Ruth and Clayton, Johnny and Judy Pannell, Aggie Scott and club member Boyd Firestone hiked the Rhododendron Trail to see the wild ponies and the great views; they saw many small colts and some long-eared mule colts. The Rhododendron Trail crosses the Appalachian Trail (AT) in an open area. We hiked on the AT for a ways, and then returned to its crossing with the Rhododendron Trail. After lunch we hiked on the Rock House Trail, where we saw a rock large enough to be used as a shelter; there was only one good overlook with a great view. We also saw the Old Settlement, with log cabins and other buildings from days gone by. On Thursday the 19th, we had a very large breakfast of country ham, eggs, gravy, grits, potatoes and coffee. We hiked the Cabin Branch Trail; part of this trail followed the Cabin Branch creek, where we saw a waterfall. We continued with a steep climb on this trail, following the creek. We then took a long break at the end of the trail and returned to the parking lot on the other part of the loop. On Friday the 20th, club members James and Phyllis Anderson came by the camp to visit on their way to hike up Mount Rodgers. They started up the Rhododendron Trail. The group hiked the Wilson Creek Trail from the campground, a steep decline of 7/10 of a mile down the creek. The Wilson Creek Trail is very rough with a large rock in it; the trail could not follow the creek bed. We had a hard climb to get around places along the creek, so we finally returned to the campground on a horse trail that had been a road back in the day. Clayton and wife Ruth then hiked the Listing Rock Trail near the Visitor’s Center; it was handicap-accessible and had one good view. Johnny and Judy Pannell, along with David and Debbie Flower, hiked the Pinnacle Trail. There was a big storm in the late afternoon; the shelter over our picnic table would puddle water on it and so we had to keep paddling out the water spots to get the water off the canopy. Hiawassee Hiking Club member Sheri Stuart arrived about 7:00 on Friday evening and joined the fun. On Saturday the 21st, we had another very large breakfast and waited for club member JoAnn Jackson to arrive. After she arrived, we went on another hike to see the wild ponies and some more great views. We got caught in a storm near the parking lot. On Sunday the 22nd, we had yet another large breakfast, packed up and started home with stops in Damascus for lunch and to see the sights. I thank all who came on this camping trip and contributed to the hard work of setting up camp so far from the parking lot. Campers included club members Clayton Pannell (leader), Ruth Pannell, Carol and Carroll Guhne, David and Debbie Flower, Boyd Firestone, Aggie Scott, JoAnn Jackson, and guests Johnny and Judy Pannell, Calvin and CharMaine Hayes, Sandra Wingfield, Emily Wingfield, Broder Wingfield and Sheri Stuart. 6/28, Saturday – Buggy Top Cave hike near the University of the South, between Sherwood and Sewanee. 4 miles round trip, moderate. Leader: Leon Bates. Distance from Cleveland to Sewanee: 1 hour 30 minutes. Hike Report: Six hikers, all club members, took the rocky trail to Buggy Top Cave on a semi-overcast day with thunderclouds that rumbled in the background. Progress was slow, due partially to the care that was needed traversing the wet rocks and partially to the many informative conversations about the native plants found along the way, thanks to our knowledgeable hike leader Leon Bates and Rick Foster. We finally arrived at our lunch destination, which turned out to be a top cave that connects to Buggy Top Cave itself. We ate our picnic lunch there and observed comings and goings of the phoebes that were nesting in the shelter of the overhang. The way down to the final destination at Buggy Top Cave proved very treacherous indeed, and those few that did attempt it were sliding on their bottoms along the muddy slope and picking their way over large boulders. The attempt proved worth it, as the cave with its falls was an awesome sight. Those that didn’t go all the way to the bottom had to content themselves with hearing the falls from a short distance. Even though there were a few slips and falls, all made it back in one piece not long before the rains finally came. Four of us ended up afterwards at the Smokehouse in Monteagle, where we treated ourselves to the delicious country-style buffet and took home some of their excellent BBQ pork ribs and other goodies from their unique store. 7/10, Thursday – club meeting at the Golden Corral Restaurant in Cleveland at 6:00. Ann Gray will arrange with the Golden Corral. 7/12, Saturday – Hiwassee River Float Trip, from the Hiwassee/Ocoee State Park/Gee Creek parking area off Highway 64 to Patty Bridge. We will time this for when the water is down. Must bring own canoe/kayak or share or rent one. Leader: Clayton. We will meet at the boat ramp in the Hiawassee/Ocoee State Park (Gee Creek Campground) at 2:00 p.m. We will work out a shuttle when we meet in order to get some vehicles to Patty Bridge, from where we will launch out. The river most likely will be low, but we plan to float anyway. Everyone is responsible for their own canoe or kayak, life jackets, paddles, drinking water, snacks and any other needs. Note: life jackets MUST be worn at all times when on the river. Please contact Clayton Pannell if you plan to attend, by calling 423-263-9730 (home) or 423-435-1848 (cell). Directions from Cleveland: head east on U.S. Highway 64, and take the access road to U.S. Highway 411 in Ocoee (right past the McDonald’s on the right). Turn left on 411, continuing north, going through Benton, and past the Polk County High School on the right. Soon after you cross the Hiawassee River, you will see Spring Creek Road off to the right. Turn down Spring Creek Road and continue on this road a mile or two, crossing over Gee Creek. Not long afterwards, you should see a sign for the Hiawassee/Ocoee State Park on the right. Turn down this road, going for a short ways. You should see the Gee Creek Campground off to the left. Turn in here and look for the boat ramp. Trip Report: On a hot and sunny Saturday afternoon five club members met at the boat ramp on the Hiwassee River in the Gee Creek Campground. We shuttled some of our vehicles at Patty Bridge in preparation for our take out, then we waited a short time at the boat ramp for the river flow to rise up. With the increase of water we easily started our float down the river to Patty Bridge, as it takes a lot less effort to go down the river in high water. Members on the trip were Clayton (leader) and Ruth Pannell, Leon Bates, Joann Jackson and Al Rymer. Thanks to all that came out for the trip and helped with the shuttle! 7/27, Sunday afternoon – Gee Creek Recreational area hike. 2 ½ miles round trip, easy to moderate. There may be some stream crossings. Leader: Leon Bates. Rating: easy to moderate. Length: 2.5 miles round trip. This will be joint hike with the Cherokee Hiking Club and the Tennessee Valley Wild Ones (native plant society; website is http://tennesseevalley.wildones.org/ ) to the Gee Creek Wilderness will be Sunday afternoon July 27. Meet at the Gee Creek Trailhead near Delano at 1:30 p.m. and bring water, snacks and rain gear. The 2.5-mile round trip is rated easy to moderate with spectacular scenery and diverse wildlife habitat. Contact Leon Bates at 256-710-5508 for more details, and to confirm participation. Directions from Cleveland: head east on U.S. Highway 64, and take the access road to U.S. Highway 411 in Ocoee (right past the McDonald’s on the right). Turn left on 411, continuing north, going through Benton, and past the Polk County High School on the right. A little ways after you cross the Hiawassee River, you will see Gee Creek Road off to the right. Turn down Gee Creek Road and continue on this road for a little while; it will first go south and then head back up toward the northeast. After a little while, you will see the trailhead off to the left. To make sure you don’t miss it, please contact Leon a day or more ahead of time at the number listed above, as cell service will be limited in this area. Trip Report: The day was very hot & humid, but the air got cooler as we climbed toward the falls. The water was cold but felt great to wade in. The hike was easy overall, but the Forest Service rated it difficult on the sign beside the trailhead because of the last part near the falls, which was tricky because of the steep drop-off on one side, and the need for careful footwork among the steep rocks. Tree roots and fellow hikers helped a lot in the effort to negotiate this last part. A convivial time was had by all, and our hike leader Leon proved a wealth of information about plant life and the history of the area, as usual. Every mountain nearby, including the infamous Starr Mountain, was discussed as to its contribution to 19th and 20th Century history. Especially interesting were the old iron works from the 1850's and the remains of an old grist mill in the creek near the falls. Attendees included club members Leon Bates (hike leader), Tom and Laura Hertz, James and Phyllis Anderson, Rebecca Levings and guest Calvin Sherman. Shown below at right is our group shot, missing photographer Leon, who is shown by himself at left. See more pictures of this event at http://www.meetup.com/Cherokee-Hiking-Club-of-Southeast-Tennessee/photos/23518362/. 8/10, Sunday – Float Trip. Location? Leader: Clayton. Bring your own canoe/kayak. We will meet at the boat ramp in the Hiawassee/Ocoee State Park (Gee Creek Campground) at 2:00 p.m. We will work out a shuttle when we meet in order to get some vehicles to Patty Bridge, from where we will launch out. The river most likely will be low, in which case we may wait a sort time for the river to start to come up. Either way we will float. Everyone is responsible for their own canoe, tube or kayak, life jackets, paddles, drinking water, snacks and any other needs. Note: life jackets MUST be worn at all times when on the river. Please contact Clayton Pannell if you plan to attend, by calling 423-263-9730 (home) or emailing crpannell@comcast.net . Directions from Cleveland: head east on U.S. Highway 64, and take the access road to U.S. Highway 411 in Ocoee (right past the McDonald’s on the right). Turn left on 411, continuing north, going through Benton, and past the Polk County High School on the right. Soon after you cross the Hiawassee River, you will see Spring Creek Road off to the right. Turn down Spring Creek Road and continue on this road a mile or two, crossing over Gee Creek. Not long afterwards, you should see a sign for the Hiawassee/Ocoee State Park on the right. Turn down this road, going for a short ways. You should see the Gee Creek Campground off to the left. Turn in here and look for the boat ramp. On a cloudy Sunday afternoon, ten of us set out to hike the 2 1/2 mile Rhododendron Trail along the beautiful Ocoee River. Due to twist of fate (a truck spilled its load of drainage pipes on Highway 64), one group was delayed in its arrival. Therefore the group was split into two parts, with ½ of the hikers in each group. The first 5 to set out from the Thunder Rock parking lot were led by Becky Levings, and also included club members Olga Cinnamon, and Tom and Laura Hertz. This group met Dale, a friend of the Hertz’s, at the Ocoee Whitewater Center at the Trail’s other end. On their way back from the Whitewater Center they met up with the other half of the group, led by long time club member Joanne Jackson. Included in this group were Ruth and Clayton Pannell, soon-to-be new member Colleen Elwood and guest Brook Muellar. We all enjoyed an easy trek with pleasant talk, spotted brilliant cardinal flowers (picture at left) in the woods and took pictures on the boardwalk. We rested at the Whitewater Center and learned the history of the Ocoee River from Ruth on the way back. A fascinating discovery was the blue and white fruit (berries) of the silky dogwood along the river stone path. Many thanks to club member/plant expert Leon Bates for the plant IDs. With a 50% chance of rain, fate ended up being kind to us with nary a drop of rain on this hike. Our reunited group is shown in the picture below: kneeling in front is guest Brook Muellar; in the next row, standing or sitting from left to right are Coleen Elwood, Ruth Pannell, Tom Hertz, Laura Hertz and hike leader JoAnn Jackson; in the back row standing are Olga Cinnamon, Club President Clayton Pannell and guest Dale. Not included is Becky Levings, taking the picture. 9/11, Thursday – club meeting/potluck at Fletcher Park in Cleveland at 6:00 p.m. Ann Gray will arrange with Fletcher Park. 9/13, Saturday – John Muir Trail hike from Towee Creek at the Narrows. Moderate, 5 miles. Leader: Ruth Gafford. 9/21, Sunday – Old Copper Road Hike. Easy, 4 miles. This hike was on the schedule for September. Rebecca and the brave company of 4 other members and one guest decided this hike was a “go”, opting to go on Saturday 9/20 instead of the originally scheduled Sunday 9/21. The day was a gorgeous and mild early fall day, full of sunshine, birdsong and fresh outdoor smells. The leaves on some trees and bushes were just beginning to turn; several kayakers were out thrashing out in the roiling surf of the rushing Ocoee, as the cold water dashed over the many rocks. We also dodged several mountain bicyclists as they rapidly made their way up the trail. We started out at the Ocoee Whitewater Center. The trail, a pleasant 4.6 mile stroll (there and back) with only 100 feet of elevation gain/loss, ended at the forest road and the welcome, if basic, restrooms, where we ate our snacks at a picnic table. We greatly enjoyed each other’s company as well as the beautiful environment, varied plant, fungal and human life. We returned to the WW Center and rested again. A few of us explored the offerings of the gift shop there. Sadly the ice cream shop that used to operate there is now closed; hopefully another enterprising business person will open up a new food shop in that space soon. Historical background: The Old Copper Road is what is left of the old 33-mile road between the once-thriving town of Copperhill TN and Cleveland. This road was used to transport the copper ore by wagon from the copper mines at Copperhill to Cleveland. From there, the copper ore was transported to other sites by train for processing. The Old Copper Road was eventually replaced by the L&N train which was built between Etowah and Copperhill, going up through the Hiwassee River gorge, passing through Farner. See the photo (thanks to Olga Cinnamon) above of the historical plaque. More history from http://www.blueridgemountains.com/mccaysville.html: discovery of copper occurred in 1843 in an area now known as Ducktown in Tennessee. By 1847, it is recorded that 90 cakes of ore were transported by Cherokee laborers over poor trails to the railroad at Dalton GA. In the spring of 1899 the Tennessee Copper Company began smelting works near McCays GA, and that town grew rapidly. Grading for the company railroad began and a shaft was sunk for the Burra Burra Mine in Ducktown. Learn more about the mining history of the Copper Basin at the Burra Burra Mine historic mine site in Ducktown; their website is http://www.ducktownbasinmuseum.com/. Below is pictured our gallant group, which includes Rebecca Levings (hike leader), club members Olga Cinnamon, Rose Hambright, Laura and Tom Hertz and guest Dale. Thanks to the kind motorcyclist at the White Water Center who took our picture. Please see http://www.meetup.com/Cherokee-Hiking-Club-of-Southeast-Tennessee/photos/24862122/ for more photos. Leader: James Anderson. Rating: strenuous. Length: 5.5 miles one way. This is the backpacking trip to Big Frog that to be canceled earlier in the year. It will be strenuous, and will be 5.5 miles in and 5.5 out. Anyone wishing to go must make contact with James Anderson at 423-715-8824 (cell) prior to going so that he can talk with you about your backpacking ability. James will share the specifics about where and when to meet with those people that contact him. Please call NO LATER than 8:00 p.m. on Thursday, September 25 in order to give him some information, and to give yourself time to prepare. 10/11, Saturday – McCamy Lake/Lake Chilhowee Recreational Area combination hike and club meeting. The meeting will be held along with a potluck supper at the Lake Chilhowee Recreational Area at McCamy Lake at 6:00 p.m. It will be held after the optional hike. Beforehand, there will be a hike on the Benton Falls Trail, which is an easy 1.5 mile hike (one way) to the 65-foot high Benton Falls. Note: there is a $3 day use fee per vehicle for entry into the Chilhowee Day Use area. If coming to the hike, please come around 4:00 p.m. The group will be self-organized with no formal leader. See the link to the map below for directions to the trailhead. Directions from Cleveland: take U.S. Highway 64 east and cross U.S. Highway 411. Continue east on Highway 64 until you reach Parksville Lake on the right. Keep going a little further, and turn left on Forest Road 77 at the Ocoee Ranger Station on the left (3171 Highway 64). Go around 7.3 miles to the campground sign and turn right into the Chilhowee Day Use area. See http://www.fs.usda.gov/Internet/FSE_DOCUMENTS/stelprdb5275546.pdf for more information and maps of the campground area. Leaders: David and Debbie Flower. Rating: easy to moderate. Length: 3 miles one way with a car shuttle or 6 miles both ways.This hike has been rescheduled from October 4. The hike is a beautiful, easy 3-mile trail along the Hiwassee River. It can be either a 3-mile or a 6-mile hike, depending on time and car shuttle. Please bring gloves, small tools, water and a snack/lunch. Trash bags will be provided. We will meet at the Childers’ Creek Trailhead at 9:00 a.m.
Trip report: It was a gorgeous day as five hikers set forth to clean up the three mile “Adopt a Trail” section of the John Muir Trail along the Hiwassee River. The trail was clipped and snipped, and a few smaller trees down on the trail were sawed up and removed, leaving a couple of larger ones that will need a chainsaw. We saw one snake and a few wildflowers. There was very little trash collected. Hikers included Deborah and Dave Flower (hike leaders), Carol Kamm, Karen Young, Becky Levings and Brendan Levings. Below is pictured our hard-working group; thanks to Brendan Levings who took the picture. 10/25, Saturday – Indian Boundary Trail hike. Easy, 3 miles round trip. Leaders: Ann Gray and Martha Firestone. There is a good foliage display this time of the year. Hike leaders: Martha Firestone and Ann Gray. Rating: easy. Length: 3.1 miles. This is an easy hike around the lake at the Indian Boundary area in Tellico. There is very little elevation change and restrooms are available about mid-way on the trail. Leaves should be at their peak and views of the lake and mountains will be at their prime. Bring water and a snack as we may drive to the top of the Cherohala Skyway following the hike, and then eat at the Tellicafe in Tellico. See the Tellicafe’s Facebook page at https://www.facebook.com/pages/Tellicafe/371459711912 for a menu and other information. Contact Ann Gray at 423-240-8863 (cell) if you want to meet at the Cleveland location at 9:00 a.m. This will be at the Medical Center Pharmacy Compounding Pharmacy, 2401 North Ocoee Street (near Fike Funeral Home). Alternatively, you can meet Martha Firestone in Tellico Plains at the Hardee’s there at 10:00 a.m. Please contact Martha at 423-309-8024 (cell) if you are interested in doing this. Please don’t wait until the last minute to call, as cell connectivity can be iffy in remote areas. Trip Report: On a beautiful fall morning, nine of us hiked the 3.1 mile trail at Indian Boundary Lake. The fall colors were beautiful and everyone enjoyed the crisp morning weather. Hikers included members Clayton and Ruth Pannell, Boyd Firestone, Joanne Jackson, Rebecca Levings, new member Letha Kelly, guest Nathan Gafford, and hike leaders Ann Gray and Martha Firestone. Following the hike, some drove on up the Cherohala Skyway, while others headed to the Tellicafe in Tellico Plains for lunch. Our group is shown below squinting into the bright morning sunshine. Thanks to the nice lady who took our picture! More pictures from this hike can be seen at http://www.meetup.com/Cherokee-Hiking-Club-of-Southeast-Tennessee/photos/25502442/. Leader: Rebecca Levings. Rating: easy. Length: 2.5 mile loop. Due to legal/liability issues, volunteers for this event needed to have signed the CSCC form first. We are adopting this trail, and this is our first clean-up. The forms need to be signed just once a year. Our next cleanup of this trail will occur in the spring 2015, in similar fashion to our current John Muir Trail cleanup, which we will be continuing as well. Just light sawing and cutting will be needed this Saturday, so just bring light tools such as bow saws, loppers, clippers and garden or work gloves. Wear long pants, since there is poison ivy in the area. Please also bring water and any snacks you will need. The CSCC doors will probably be locked on Saturday so it’s doubtful that vending machines will be available.Directions in Cleveland: go I-75 to Exit 27 and turn west on Paul Huff Parkway, toward Georgetown Road. Go past the mall with Target on the right, and turn left at the next traffic light after the mall, before you go up the hill; this is Adkisson Drive turning left (it’s Frontage if you turn right). Go past the Bradley County Driver’s License place on the left and you will come to Cleveland State CC down a little way. You will see the tennis courts on the right as you first get to the college. If you pass Norman Chapel road on the left (brown Baptist Student Union on the corner), you have gone a little too far. Turn in the parking lot beside the tennis courts and go all the way to the back. Please contact Rebecca if you have any questions at 423-310-0523. 11/8, Saturday – Carter’s Lake hike. Easy-moderate, 4 ½ - 5 miles. This hike features a pretty water cascade. Leader: James Anderson. Leader: James Anderson. Rating: easy to moderate. Length: 4.5 mile loop. The trail is a 4.5 mile loop with views of Carter Lake, between Chattsworth and Elijay. It also features a pretty water cascade. It is a relatively easy, and I think fairly new, trail and with little elevation change. Bring a lunch or a snack as we will stop for lunch along the trail. No one needs to call me unless they want to, as I plan to go regardless. So anyone interested can just show up and go. If weather gets rough or rainy, I may have to cancel, so please call to confirm whether the hike is on or not at 423-715-8824 (cell). Carpooling locations/departure times: · The parking lot in front of the Cleveland Home Depot at 9:30 a.m. Directions: take I-75 to Exit 27 and turn east, going toward the new Cleveland Publix on Paul Huff Parkway (on the right). Continue past the next intersection after the Publix (corner of Mouse Creek Road). You will see the Home Depot back from the road on the left. Turn there and come to the parking lot in front of the Home Depot. Commuter parking lot behind the Hardee's in Ocoee at 10:00 a.m. Directions from Cleveland: take U.S. Highway 64 east out of Cleveland and continue until you reach the intersection with U.S. Highway 411. Take the exit ramp at the Ocoee McDonalds (on the right), and turn left, going north on 411. The Hardee’s will be a very short way down on the left. Turn in the driveway right after the Hardee’s parking lot, which leads to a commuter parking area in back of the Hardee’s parking lot itself. Hike Report: It certainly was a fine day for a hike with the sun shining brightly, perfect temps, and enough fall color left to please the eye. So we set out on our adventure with great expectations and an awesome turnout of 14 intrepid and innocent souls for our 4.5 mile loop of the Amadahy Trail overlooking the deep and sinister Carter's Lake. But little did our group know at the time of the great and dark forces at work that would "spoil" our planned day of walking and relaxation in the woods. So with great anticipation we calmly and bravely caravanned down that long black ribbon of asphalt most people call Highway 411 South. Passing the beautiful old courthouse in Chatsworth and meandering on the small paved back road through the woods we found the turnoff to the Woodring Branch Recreation area. Slowly and carefully navigating the hairpin turns we drove through the north Georgia woods, finally arriving at the turnoff to the trail head. Not only did we see the beautiful crimson and orange leaves of the fall foliage, but we also noticed these mysterious white squares resting on some of the trees and trail sign posts. What were they, we discussed among ourselves? As our curiosity propelled us forward we soon were close enough to realize they had some type of writing on them. Not knowing if it was some type of ancient Indian hieroglyphics, left by those people for whom the trail is named, or possibly messages left by space aliens, we were kept guessing as to the import of the writing. Finally, several of us were able to decipher the writing to read, "TRAIL CLOSED DUE TO HUNTING." Naturally we were all quite disappointed, because as we stood there contemplating our options several other groups arrived and were as surprised as we were that the trail was closed. So not to be defeated, we decided to go to another area where we could take a walk to some cascades and at least have lunch. We were told about another trail loop that we could also possibly hike. So we loaded up and caravanned to the Ridgeway Recreation Area, where we took a short hike to an area that overlooks the cascades of Tails Creek. It turned out to be a beautiful spot to eat our lunch while looking at the beautiful cascades and listening to the roar of the water. There was a loop trail around this area, but it also turned out to be closed due to hunting as well. So as an alternative, some of the group out of nothing but pure desperation decided to walk the paved roads in that area so they could get their "fix" of at least some hiking time. Not all stooped this low but many did. However being the disciplined and ethical hike leader that I am, I will keep that secret forever, or at least till the Christmas Party! Our hikers included Edmond Gray, Carroll Guhne, Carol Guhne, Kathy Seymour, Randy Morris, Clayton Pannell, Ruth Pannell, Puspa Das, Robert Nichols, Lettie Burress, Mitzi Ownby, Gary Patty, Letha Kelly and Phyllis Anderson. Some of our hikers are pictured below, not including yours truly (James Anderson, hike leader), who took the picture. More pictures of this event can be seen at our club Meetup site for this event at http://www.meetup.com/Cherokee-Hiking-Club-of-Southeast-Tennessee/photos/25766749/. 11/13, Thursday – club meeting at 6:00 p.m. at the Whitewater Grill across from the Dam Deli on Highway 64 (corner of Cookson Creek Rd). Randy Morris will schedule with Whitewater Grill. 11/15, Saturday - Flats Mtn hike, Moderate 6.2 miles. Leader: The Harris's and Randy Morris. The Flats Mountain Trail (Forest Service Trail 102) is a 6.1 mile hike from the Eagle Gap Parking Lot off of the Cherohala Skyway to Beehouse Gap on Citico Creek Road. It has an elevation change of approximately 1900 feet and is rated moderately strenuous since we are going downhill most of the way. We will do a 7.4 mile car shuttle to enable us to hike it in one direction. The trail follows the crest o f Flats Mountain in a general downslope from its high point on Flats Mountain of 3860 feet to its low point at Beehouse Gap (1960 feet in elevation). It has some good views in both directions off of the “hogback” portions of the ridge into the Citico Wilderness Area and of Indian Boundary Lake. Much more information can be found on our website at http://cherokeehikingclub.org/Flats%20Mtn%20Trail.pdf. We will have three meeting locations for the hike and plan on leaving promptly at the designated times from each so please be on time or risk being left. The locations and departure times are: (1) The lot behind the Ocoee Hardees’ location at 8:00 a.m., (2) the Bi-Lo parking lot in Etowah at 8:30, and (3) the parking lot behind the Cherohala Skyway Visitor Center in Tellico at 9:00 a.m. You may choose which site is more convenient for you and meet us there. If you have questions you may contact Randy at 423-650-0485 before 8:00 p.m. on Friday, November 14 or email Rick at harrisri@aol.com. This hike will be cancelled if bad weather. Please be sure to check with the leaders if weather looks iffy. Hike Report: Five hikers and one hiking dog hiked the 6.2 mile Flats Mountain Trail from Eagle Gap (off the Cherohala Skyway) to Beehouse Gap to Beehouse Gap on Citico Creek Road. We enjoyed a glorious, crisp late autumn morning with signs of winter very evident at the higher elevations as we were treated to a beautiful ice event on the area trees. We had great views off the hogback ridge in both directions along our descent of the mountain—seeing Indian Boundary Lake, Big and Little Fodderstack, and views of the distant Joyce Kilmer Wilderness Area in the distance. With a few short uphill sections and a 1900 elevation descent we got a good little workout. After a great hike with good fellowship, we all squeezed into my old Honda accord to travel back to Eagle Gap to retrieve the other vehicles. Jake for one wished I had a larger vehicle (with automatic transmission!) as I disturbed his after-hike nap when I changed gears. Hikers who trekked with Jake included James Anderson, David Carringer, Rick Harris, Jennifer Schroll, and Randy Morris (reporting). 11/19, Wednesday - Sequoyah Hiking Club Series of Hikes on the East Lakeshore Trail - The East Lakeshore Trail is on the north side of Tellico Lake to the west of US 411 near Vonore. The trail is about 25 miles long with parking areas about every 4-5 miles along the trail. We will be hiking each section from east to west each Wednesday over the several upcoming weeks. Today we will be hiking the Morganton Branch Section from the Wildcat Pointe parking area to the Peterson Road trailhead, only about 3.0 miles. The trail is well groomed and easy to hike with a few minor ups and downs. We will hike rain or shine, snow or sleet. We will be meeting at the parking lot of Las Fuentes Restaurant in Madisonville (just before Walmart on US 411 north of TN 68) at 8:45AM. We will work out our shuttle and leave the parking lot promptly at 9 AM. You do not need to sign up in advance, just show up with appropriate clothing and bring lunch and water. After the hike, we may go to a local eating establishment. This hike is open to anyone belonging to either hiking club and others as well. Dogs on leash are welcome. For more information, contact Rick Harris at 423-253-6358 or HarrisRi@aol.com. Information and maps of the trail can be found at http://www.tellicowater.org/trails.html. 11/26, Wednesday - Sequoyah Hiking Club Series of Hikes on the East Lakeshore Trail - The East Lakeshore Trail is on the north side of Tellico Lake to the west of US 411 near Vonore. The trail is about 25 miles long with parking areas about every 4-5 miles along the trail. We hiked the Morgantown Branch section of the trail Wednesday, November 19. We will be hiking each section from east to west each Wednesday over the several upcoming weeks. Today we will be hiking the Jackson Bend Branch Section from the Peterson Road trailhead to the Lotterdale Kiosk, just a little over 5 miles. The trail is well groomed and easy to hike with a few minor ups and downs. We will hike rain or shine, snow or sleet. We will be meeting at the parking lot of Las Fuentes Restaurant in Madisonville (just before Walmart on US 411 north of TN 68) at 8:45AM. We will work out our shuttle and leave the parking lot promptly at 9 AM. You do not need to sign up in advance, just show up with appropriate clothing and bring lunch and water. After the hike, we may go to a local eating establishment. This hike is open to anyone belonging to either hiking club and others as well. Dogs on leash are welcome. For more information, contact Rick Harris at 423-253-6358 or HarrisRi@aol.com. Information and maps of the trail can be found at http://www.tellicowater.org/trails.html. 11/29, Saturday – Linda Davis Memorial Hike at the Cleveland Greenway. Leader: Randy Morris. Rating: Easy. Length: 8.5 miles round trip (variable). Dog-friendly for leashed dogs. Come join us and work off some of those Thanksgiving calories! The annual Saturday after -Thanksgiving hike will be a roundtrip stroll along the 4 to 4.25 mile Cleveland/Bradley County Greenway, for approximately 8.5 miles total. This hike, named in honor of long-time hike leader and CHC member Linda Davis, is traditionally the Saturday after Thanksgiving. It will be up to an 8.5 mile hike, depending on how long you hike with us. Since it is on the Greenway, you are welcome to shorten the hike as you like. It is a great trail along Mouse Creek that is heavily utilized. This Saturday morning hike is a good time to enjoy the trail with far less people than usual. We will head south from a middle-point on Raider Drive to the Greenway’s present southern terminus at Willow Street and then back-track to our starting point, then going north under Mohawk Drive to the northern end near the Home Depot, then back again to Raider Drive. There are various places along the Greenway that you can park, and then return to for a shorter walk, including the parking lot near the northern-most point near Home Depot, Tinsley Park, and others. NOTE: please do not leave valuables in your car! Thieves have been known to occasionally break into a cars parked near the Greenway and stolen items. For more information on the Greenway you may visit http://www.cbcgreenway.com/cbcgreenway/Home.html. It is a nice walk which we will hopefully enjoy on a beautiful late autumn morning. The trail is rated easy. We will begin at 9:00 a.m. from the Raider Drive trailhead, meeting under the new pavilion. Parking at the Raider Drive trailhead will be at the former First Tennessee Bank location just west of the greenway. Directions to the Raider Drive trailhead: from I-75, take Exit 25 and turn east on 25th Street, going into Cleveland. Continue until the intersection with Keith Street (U.S. Highway 11), and turn left. Continue heading north until you reach the intersection with Raider Drive (Casa Nachos restaurant is on the left corner). Turn left on Raider and go a very short way. You will see the pavilion and trailhead. If you have passed Cleveland High School on the right, you have gone too far. Please call Randy Morris at 423-650-0485 no later than 9 p.m. Friday, November 28 if you have any questions. Note: this hike will be cancelled in the event of rain. Hike Report: Six club members and Kathy Seymour’s dog Holly worked off some Thanksgiving calories on a cloudy, cool morning along the Cleveland/Bradley County Greenway. We started at the approximate half-way point at the Raider Drive trailhead and proceeded south to Willow Street before re-tracing our steps back to Raider Drive for a distance of about 4 miles. Many decided to call it a day at that point, but another 4.5 miles was there for the taking; I hiked the entire 8.5 miles before heading off to yet another Thanksgiving Meal. We encountered quite a bit of wildlife during the hike - the always friendly and hungry ducks, a Great Blue Heron, some other canines, and of course some animals of the human variety including joggers, walkers and strollers. Hikers included Carol Guhne, Clayton and Ruth Pannell, Jennifer Schroll, Kathy Seymour, and Randy Morris, hike leader. Pictured below are our group (minus Randy, taking the picture) and one of the friendly ducks. Other pictures of this hike event can be viewed at http://www.meetup.com/Cherokee-Hiking-Club-of-Southeast-Tennessee/photos/25771682/. 12/3, Wednesday - Sequoyah Hiking Club Series of Hikes on the East Lakeshore Trail - The East Lakeshore Trail is on the north side of Tellico Lake to the west of US 411 near Vonore. The trail is about 25 miles long with parking areas about every 4-5 miles along the trail. We will be hiking each section from east to west each Wednesday over the several upcoming weeks. Today we will be hiking the Lotterdale Branch Section from the Lotterdale Kiosk to the Sinking Creek Trailhead, just 3.8 miles. The trail is well groomed and easy to hike with a few minor ups and downs. We will hike rain or shine, snow or sleet. We will be meeting at the parking lot of Las Fuentes Restaurant in Madisonville (just before Walmart on US 411 north of TN 68) at 8:45AM. We will work out our shuttle and leave the parking lot promptly at 9 AM. You do not need to sign up in advance, just show up with appropriate clothing and bring lunch and water. After the hike, we may go to a local eating establishment. This hike is open to anyone belonging to either hiking club and others as well. Dogs on leash are welcome. For more information, contact Rick Harris at 423-253-6358 or HarrisRi@aol.com. Information and maps of the trail can be found at http://www.tellicowater.org/trails.html. 12/10, Wednesday - Sequoyah Hiking Club Series of Hikes on the East Lakeshore Trail - The East Lakeshore Trail is on the north side of Tellico Lake to the west of US 411 near Vonore. The trail is about 25 miles long with parking areas about every 4-5 miles along the trail. We will be hiking each section from east to west each Wednesday over the several upcoming weeks. Today we will be hiking the Sinking Creek Branch Section from the Sinking Creek Trailhead to the Coytee Trailhead, about 4.5 miles. The trail is well groomed and easy to hike with a few minor ups and downs. We will hike rain or shine, snow or sleet. We will be meeting at the parking lot of Las Fuentes Restaurant in Madisonville (just before Walmart on US 411 north of TN 68) at 8:45AM. We will work out our shuttle and leave the parking lot promptly at 9 AM. You do not need to sign up in advance, just show up with appropriate clothing and bring lunch and water. After the hike, we may go to a local eating establishment. This hike is open to anyone belonging to either hiking club and others as well. Dogs on leash are welcome. For more information, contact Rick Harris at 423-253-6358 or HarrisRi@aol.com. Information and maps of the trail can be found at http://www.tellicowater.org/trails.html. 12/17, Wednesday - Sequoyah Hiking Club Series of Hikes on the East Lakeshore Trail - The East Lakeshore Trail is on the north side of Tellico Lake to the west of US 411 near Vonore. The trail is about 25 miles long with parking areas about every 4-5 miles along the trail. We will be hiking each section from east to west each Wednesday over the several upcoming weeks, with a break over the Christmas and New Years holidays, then picking up in January. Today we will be hiking the Coytee Loop Branch and Glendale Branch Sections from the Coytee Trailhead to the Glendale Trailhead, about 5.4 miles. The trail is well groomed and easy to hike with a few minor ups and downs. We will hike rain or shine, snow or sleet. We will be meeting at the parking lot of Las Fuentes Restaurant in Madisonville (just before Walmart on US 411 north of TN 68) at 8:45AM. We will work out our shuttle and leave the parking lot promptly at 9 AM. You do not need to sign up in advance, just show up with appropriate clothing and bring lunch and water. After the hike, we may go to a local eating establishment. This hike is open to anyone belonging to either hiking club and others as well. Dogs on leash are welcome. For more information, contact Rick Harris at 423-253-6358 or HarrisRi@aol.com. Information and maps of the trail can be found at http://www.tellicowater.org/trails.html. 12/27, Saturday - TN/NC BMTA Work Trip - Whigg Meadow Section - The TN/NC trip will be, “tentative to weather conditions”… working from Whigg Meadow downhill to Mud Gap clearing with chainsaws and brush cutters/loppers as needed. We will carpool from Skyway Visitor Center to Whigg Meadow leaving a vehicle at the Mud gap lot for shuttle. Meet: 8:30 at the Tellico Grains Bakery or at 9 AM behind the Skyway Visitor Center. If you have questions or plan to attend this work trip please send an email to: tncmaint@bmta.org.